A Purim children’s rally with the Rebbe, Rabbi Menachem M. Schneerson, of righteous memory. A Chanukah children’s rally with the Rebbe, Rabbi Menachem M. Schneerson, of righteous memory. 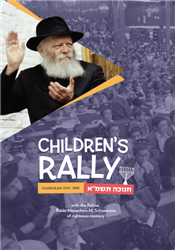 A Pesach children’s rally with the Rebbe, Rabbi Menachem M. Schneerson, of righteous memory.